Thanks to all the ladies that joined in our "Mother's" challenge this month. The entries were so gorgeous. 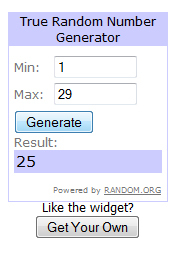 We used random.org to choose a winner of the High Hopes stamp pack. Karen from Card's By Karen is our winner! Congrats. Please email us at lora at onecrazystamper dot com to claim your prize! Be sure to check back tomorrow for our new challenge and another chance to win! Hi all, Madge here for another wonderful Wednesday as I sit here typing I’m looking out onto the lake, which is as smooth as glass and a deep emerald color. I’m R & R-ing………. which doesn’t mean a lot different than “retired”. DH is out trying to catch the illustrious “big one”, which keeps avoiding his hook. I’ve chosen to use “Dandelion Girl” designed by Sylvia Zet © Wee Stamps for Whimsy Stamps. Lora is out of this image at the moment, but if you would like it, email OCS and I’m sure she will comply. The patterned paper background is Basic Grey "Plumeria". Image was stamped with Memento Tuxedo Black, colored with Copic Markers, die cut with Spellbinders Labels One and mounted onto a Martha Stewart Border / Corner punch. Butterfly and pearls from stash. I cut into the background paper to insert the matted image under the beautiful design of the paper. (I dislike covering up beautiful designer paper). TWO more days and OCS will have another NEW challenge for you to enter and the chance to win “FREE STUFF”. Meanwhile you still have a chance to enter your creation into the “Mother’s theme” for this month. It's Terrific Tuesday again for One Crazy Stamper, and today I am featuring a brand new Whimsy Stamp from artist Sylvia Zet called "Hopeful". The image was stamped on Copic Xpress It cardstock with Memento Tuxedo Black ink, then colored with Copics. I used Clearsnap Smooch Illuminate paint on the lantern to make it shine, and of course you can't see it, but it's there! The image was then layered on four different papers from an older My Mind's Eye 6 x 6 paper collection Lime Twist - Happy Go Lucky. The layers were distressed with the We R Memory Keepers Heart Attack Distressing/Sanding tool, and then inked with Tsukineko Memento Dew Drops - Danube Blue and Lilac Posies. The flowers are a mix of companies, butterfly is an older Prima embellishment, and the die is from Cheery Lynn. Wishing you a sunny day today! How cute is this image?! 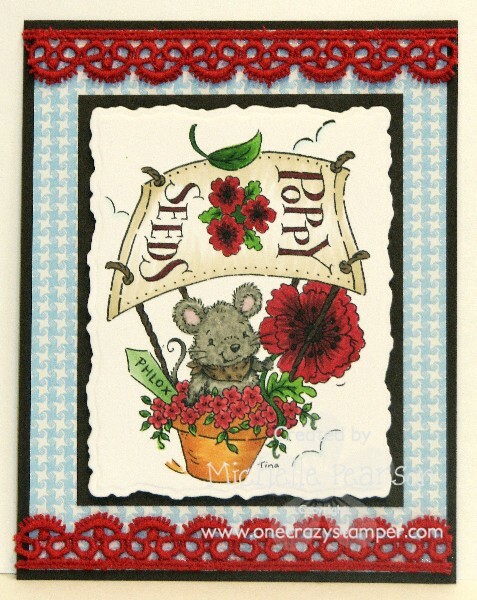 Today's card is for One Crazy Stamper and features Stampavie's Mouse and Poppy Seeds image by Tina Wenke. Other items on this card: designer paper is Melody Ross' Homespun Chic collection and lace is vintage. Be sure to pop by the One Crazy Stamper and see all of the new goodies Lora's been adding to the store! 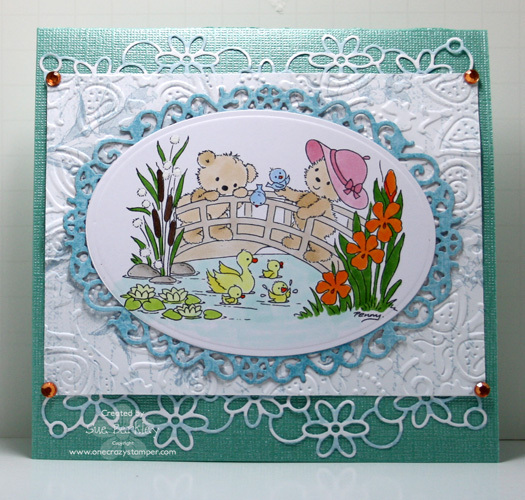 For my last post of the month, I have used this adorably cute stamp Duckling Bridge, designed by Penny Johnson for Stampavie. There are still a few days left to enter this month's challenge "Mother's". As Friday, June 1st is the start of a brand new challenge; don't forget to scout Lora's store One Crazy Stamper for some amazing deals and products. The possibilities for creativity are endless. Only a few days left to enter this months challenge for Mothers! There have been some fabulous entries! 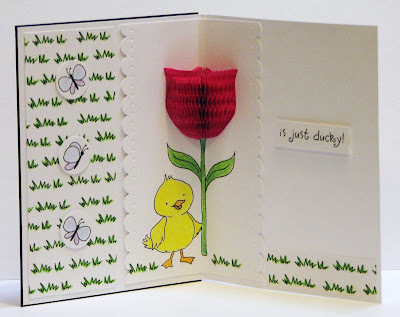 I used MFT-A La Mode-Key to my heart for my card! I am hopelessly addicted to this stamp and keep turning to it for cards!!! I love using Pink and Black together! So girly but elegant too! I of course colored with copics and I had to give her a little black dress! I paper pieced her bathing suit. I airbrushed the background and added yellow seam binding and pearls for embellishments. Die Cut is Spellbinders label 25. We require 2 projects to be submitted prior to the 1st of the month of your designated Guest Design Spot. Projects should display products carried in the One Crazy Stamper Store. Your first project will fit the OCS monthly challenge theme and the second can be any theme. If you have never popped over to the OCS DT Blog now is a great time. The Design Team & our Guest Designers offer you an amazing assortment of cards which are sure to offer you both inspiration & a wealth of knowledge. There is still of time to enter this month's challenge which is "Mother's". Do check out Lora's store, One Crazy Stamper as there is always something new every day. Hi all, for another Wonderful Wednesday. I am giggling to myself about the stamp I chose to use. It is one of those front / back stamps from OCS called Ed Front and Back. 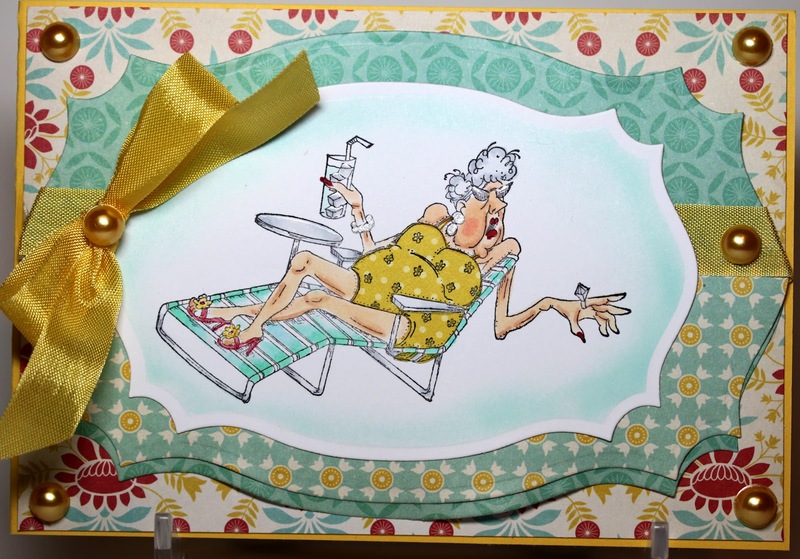 I saw this stamp and thought to myself, “I know a couple of “old geezers” that this would be perfect for……… thus the card. A birthday card for a friend, who is an expert fisherman, but I think he would see the humor in this. Both back and front were stamped onto Xpress It blend cardstock, colored with copic markers, cut out and mounted onto acetate. Purely by accident, I was playing with the acetate and curved it outwards – then thought that it would be perfect for it to be curved for sitting upright to display………. thus the two punches on the far right hand side of the card for the transparency to slip under. This card was a hoot to put together – and I giggled the whole time. I had to wait until after the Birthday to post this…….. and I’m still giggling. Remember, “Stamp up a storm, ink up a wish and send it on to make someone smile”. I LOVE Art Impressions images and the newest release has not disappointed!!! So for this weeks One Crazy Stamper project, I have used an AI People image "Power Napper Set". As usual I stamped the image with Memento Tuxedo Black ink on Copic Xpress It cardstock and colored it with Copics. No fussy cutting this time, unless you count her feet sticking out of the frame!! Spellbinders Label Two was used to cut the image out, as well as to frame it. I stamped the included sentiment repeatedly on to the dp from My Mind's Eye Fiddlesticks collection, with Versafine Onyx Black ink - the repeating seems to reflect the sentiment - stress, chaos and mayhem. The card is a gate fold with black sheer ribbon tying it closed, and Viva Decor pearls accenting it. Happy Monday! 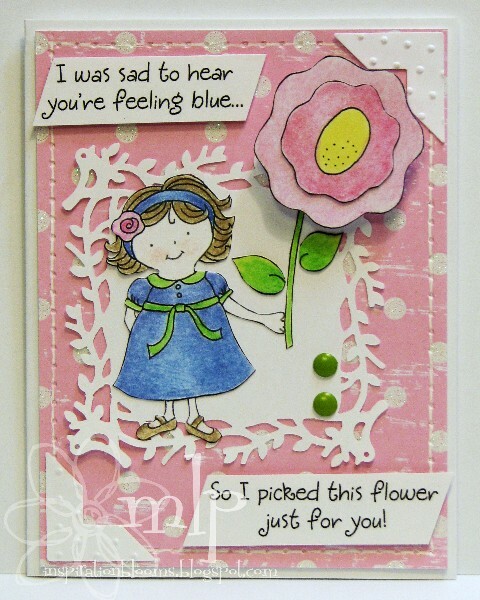 Today's card for One Crazy Stamper is a cheerful little one featuring Inky Antic's images. The flower is very fun....it is popped up with an Action Wobbles! Keep your eye out for this week's Inky Antics Blog Hop.....we'll be featuring these fun little guys with videos to show their movements! I used the Pretty Posey HoneyPoP set. These sets are versatile, you don't have to use the HoneyPoP element on your cards....this one features the Action Wobbles instead! I colored the image with Prismacolor Pencils and gamsol. This is a fun alternate to Copic Markers. You color your images with the pencils and use the gamsol to melt the pencil wax for a beautifully blended look. Other items on this card are Making Memories designer paper and Martha Stewart punch around the page punches. 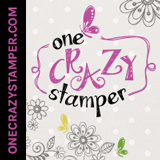 If you haven't stopped by the One Crazy Stamper store recently....be sure you do!! There is always lots of new stuff to drool over!! 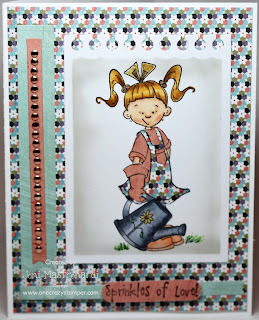 It's Sue here for another Sunday post for One Crazy Stamper. As this is the Victoria Day Weekend in Canada, and is usually the weekend that many people will start planting their gardens, I have used this Gardening Fun stamp from Stampavie for my image. Do join us for this month's challenge which is "Mothers". Also check out Lora's store One Crazy Stamper for some amazing deals. I love fun, bright Summer colors! I love teal especially! So I had to color the MFT Key to My Heart A La Mode with those colors! I love the cute sentiments with these stamps! They go great with the image but have enough versatility to them that you can use them with a lot of other things too! I also love the glossy accents. I am new to this brand and WOW do I love it!!!! It is A-MA-ZING! For those of you that love your stickles you will love this stuff cause it comes out of that super easy nozzle that allows you to manipulate the stuff! I have a bunch of charms that I have been saving (more like hoarding) and their was this adorable heart locket that went perfect with this sentiment. Hope you enjoyed and see you next week! OK so for some EXCITING news! Our For Mom challenge is going strong all month long. Check out the details Here. 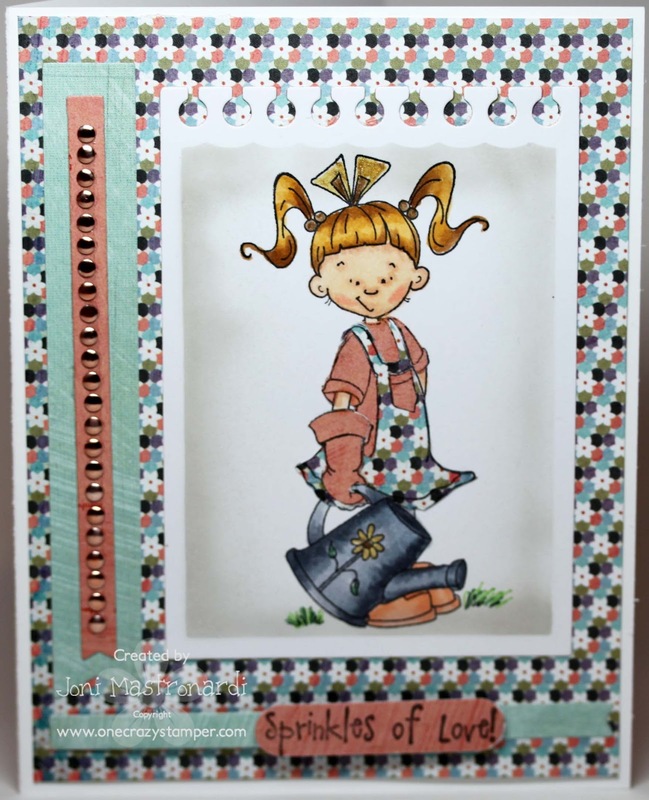 Hi everyone Cindy here Welcome to my One Crazy Stamper card. I have used the ADORABLE Wee Stamps Amy. Did you know we are looking for guest designers to help promote One Crazy Stamp, a Canadian craft store! One Crazy Stamper carries all your favorite brands. We are especially interested in Canadian designers helping to promote OCS, but all are welcome to apply. -Get to know some fabulous gals that share your passion. Please email jacijangy at gmail dot com , to apply. Please include your name & a link to your blog or gallery. No prior DT experience necessary. Hi all, Madge here for another Wonderful Wednesday. I have a friend who loves poppies…..and she has retired after 32 years on the job. By the time this is posted it should be safe, as we are taking her out for lunch and surprising her with a gift certificate. Did you know that OCS offers Gift Certificates?? A couple of hints in the right direction and you could be taking advantage of a GC from your hubby or children. Ok, on with my card. I made a Tri-fold Shutter card using a stamp set from the fairyopolis Flower Fairy series, doing paper tole on the image and placing it on a piece of watercolored paper. In the center, I needed to add some stabilizer to the card, so stamped a poppy (from a Flourishes set called Poppies and Daisies) onto a transparency and glued it to the top and bottom. This time I intentionally coated the image with Base Coat nail polish. Here is the closed version of the card. Only 4 1/4 x 5 1/2. Hope you’ll take time to enter the OCS May Challenge for “Mothers”. Remember, “Stamp up a storm, ink up a wish and send it on to someone to make their day”. It's terrific Tuesday again!!! Where does the time go? 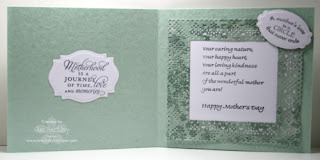 One Crazy Stamper's theme for the monthly challenge is.... drum roll please...Mothers!!!! I've colored up another Kraftin' Kimmie image, "Rescue Ranger" with Copics, then layered her on three dp's from Simple Stories Fabulous collection and Bazzill Vintage Pink cardstock. 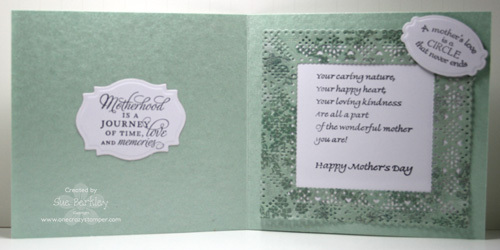 The sentiment is included with the image, and the pearls were made with a Light Green Viva Decor Pearl Pen. Have a great day and take time to enjoy the ice cream treat you are now craving!! We are looking for guest designers to help promote One Crazy Stamp, a Canadian craft store! One Crazy Stamper carries all your favorite brands. We are especially interested in Canadian designers helping to promote OCS, but all are welcome to apply. Jacilynn at jacijangy at gmail dot com , to apply. Please include your name & a link to your blog or gallery. No prior DT experience necessary. 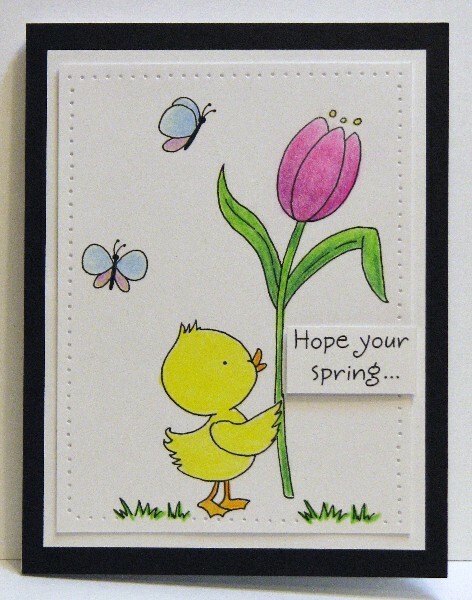 Just had to share this cute little spring card this morning! 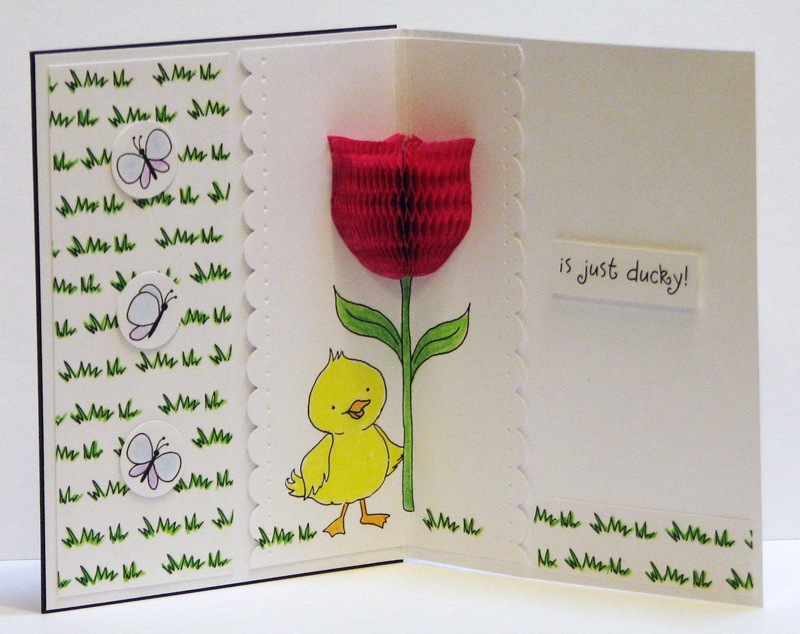 This uses the Tulip Duck HoneyPop set from Inky Antics. I colored my image with Prismacolor Pencils and Gamsol. The gamsol melts the color pencil wax and blends for a beautifuly shaded effect. The fun element of HoneyPop cards is that the tulip inside the card is made with a honeycomb paper pad and pops out for a 3D surprise! 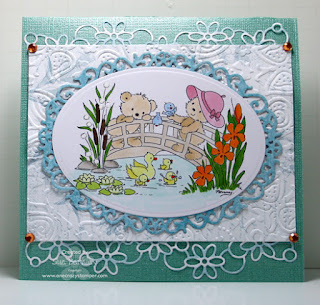 Hi Everyone It 's Sue here for another Sunday post for One Crazy Stamper. 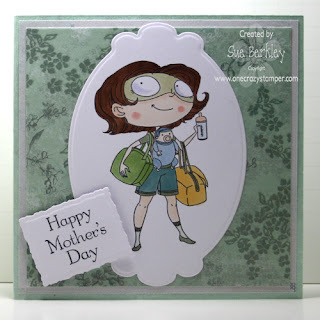 As today is Mother's Day, I have used this Marvelous Mom stamp from Kraftin' Kimmie. There is still plenty of time to enter this month's challenge which is "Mother's". Do check out Lora's store, One Crazy Stamper as there is always something new every day. Hope you are having a fabulous May so far! You still have time to enter this months challenge about Mothers! 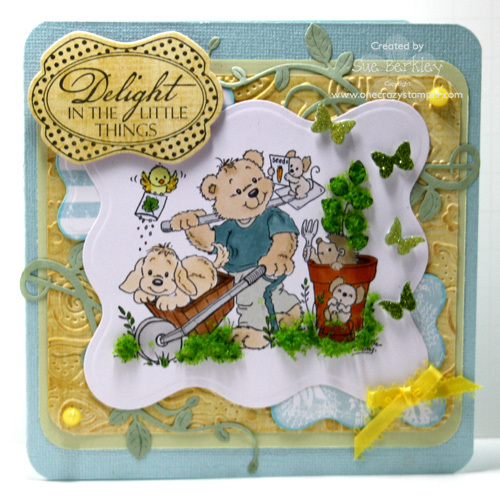 On this weeks card I used My Favorite Things, A La Mode Key To My Heart. The design paper is Basic Grey and so is the button! I of course colored with copics and used Staz on Glaz on. 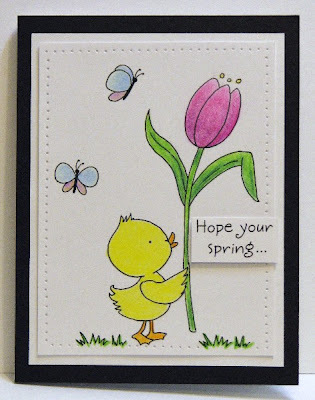 Today I have this adorable image from Kraftin Kimmie: Springtime Lulu available at One Crazy Stamper. Check out all of Lora's new items. She has a fabulous selection. I paper pieced Lulu with Basic Grey What's Up Collection and colored her hair and face with copics: C6, C4, C3, C2, E50, E00, E11, R02, YR24, Y11 and E35. Don't forget our monthly challenge! May OCS Challenge is "Mother's". We want to see your "Mom" themed cards. We can't wait to see your projects! You have until the end of the month to join in. Only new projects (no back linking to old projects). You must link us in your post. You may combine with other challenges. Only 5 entries per person each month. One lucky participant will win a from the OCS store!!!! Hi all, Madge here for another Wednesday. OCS is having a May Challenge celebrating “Mothers”… My mother loved flowers – you might say that this card is in memory of my Mom – a wonderful, kind and gracious lady …… today, I’ve chosen a Stamp Set from OCS called “Fabulous Flourishes”. I don’t see it in the OCS inventory, but it was a Flourishes Stamp set of 6, and if you’d like to have it, I’m sure Lora would be willing to order it once again. Don’t you just love flourishes? – there is so much you can do with them for an elegant, classic look. Memento Tuxedo Black ink; Xpress It blend cardstock; Fancy Tags Three; Flowers; Distress inks (Antique Linen, Dusty Concord); Brad (Bo Bunny), Ribbon (stash). This is the inside, ready for a sentiment for the right occasion. Remember, “Stamp up a storm, ink up a wish and send it on to someone to brighten their day”. May Guest Designer Linda S.
May Guest Designer Lori T.